Nidhi Sohane, our community architect, recounts her first field experience as part of mHS team and her vision of better housing for all. Terrace of a 2x4m house – twice the size of a double bed! I find myself maneuvering up a chasm of a two feet wide staircase, so steep that I clamber on its one foot high steps. They are too short and leave the heels of my feet dangling in air. I’m on my first field visit at mHS, visiting a house in an informal settlement for the first time. And as extreme as an initiation can get, it happens to be the smallest possible house typology that you’d find in the settlement.Only six by twelve feet-That’s the footprint of the three-storey house rising into the settlement, its structural walls just a third of the minimum thickness any engineer would prescribe. That is, if the homeowner could access an engineer’s advice in the first place. Here, it’s the head mason who is solely the Trinity of construction- Contractor, Architect and Engineer- in diminishing order of their perceived importance in this context. The ground floor of this house, lavishing no space in circulation, is just big enough to tightly pack a double bed which is literally what we find there. On the floors above, the two feet wide staircase occupies as much as a third of the house area, the remaining circulation space doubling up as living space where mattresses are rolled out at night. We stagger on to the terrace, where Haider, the twenty something home-owner culminates the tour of the house, beaming with pride. He announces that he would add another floor in the future, not for a moment doubting the strength of his house. Standing here, I can’t help but reel with dizziness. As an architect, it’s difficult to not be unnerved by how fragile the structure is. Adding to the vertigo is the lack of a railing around the tiny terrace with four full grown individuals crowding it. When I’m finally convinced that I have secured my footing, my eyes finally move up and sweep over the urbanscape that spans around me. I look at the patchwork of un-plastered red brick walls levelled into different floors, set against a powder blue sky. 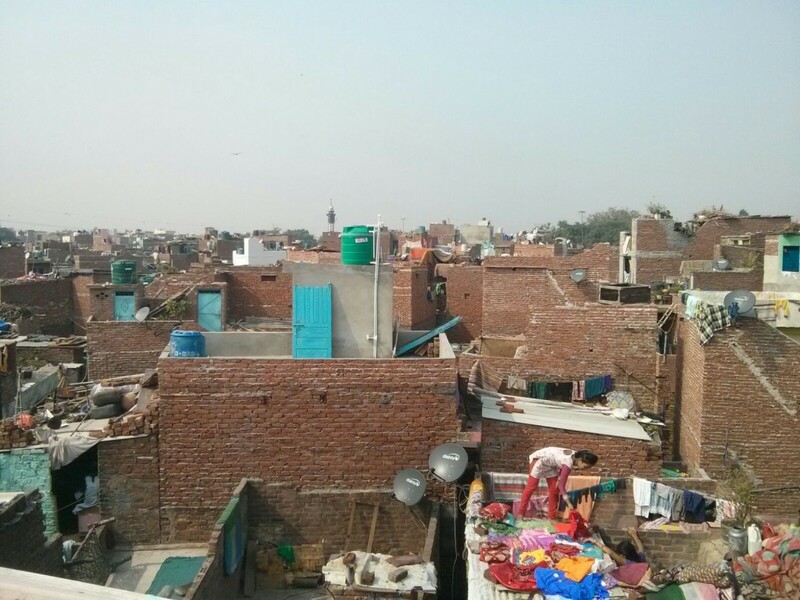 This is Sundernagri – a JJ colony that has grown alongside one of the 55 resettlement colonies that Delhi is made up of. This self-constructed facet of Delhi serves as a partial solution to housing migrants who, according to figures from 2011 census, comprise approximately a fifth of population of Delhi. Fragile though the structures maybe, homeowners here are proud of the homes they’ve built incrementally through sheer diligence. You could rightly be critical of the quality of construction. You could also marvel at how this self evolved solution has the potential to already mitigate the huge lack of housing our cities are facing. If only there was an important stakeholder interested in alleviating the housing shortage by supporting and improving these settlements. Reminds me of a 10 letter word that starts with G.
Flash-forwarding to my visit to Savda Ghevra, another resettlement colony in West Delhi, where also lies a vacant EWS ‘housing’ built by the government. Desolate four storey buildings with gaping holes for windows and doors remain unoccupied for a few years now. And steadily, the resettlement colony right next to it sprouts more and more homes as people build it themselves. The two housing scenarios depict the dichotomy between the two approaches to affordable housing. The wastefulness of the EWS housing project stands in stark contrast to the ingenuity of the self-built housing of Savda Ghevra, what I’d like to call ‘the agony and the ecstasy of affordable housing’! I dream, as one can do without constraints of reality, of an alternate scenario where all the resources of RAY housing – the materials, technical expertise and land – were employed in a scheme that supported this self construction. By just setting up a basic infrastructure viz. supply systems like sewage line, water etc, the unorganised housing could have been semi-organised, with monitored construction quality. I can only hope that the vision isn’t that farfetched! For instance, in Ahmedabad, the municipal corporation performed in-situ upgradation of slums by providing basic infrastructure (viz. 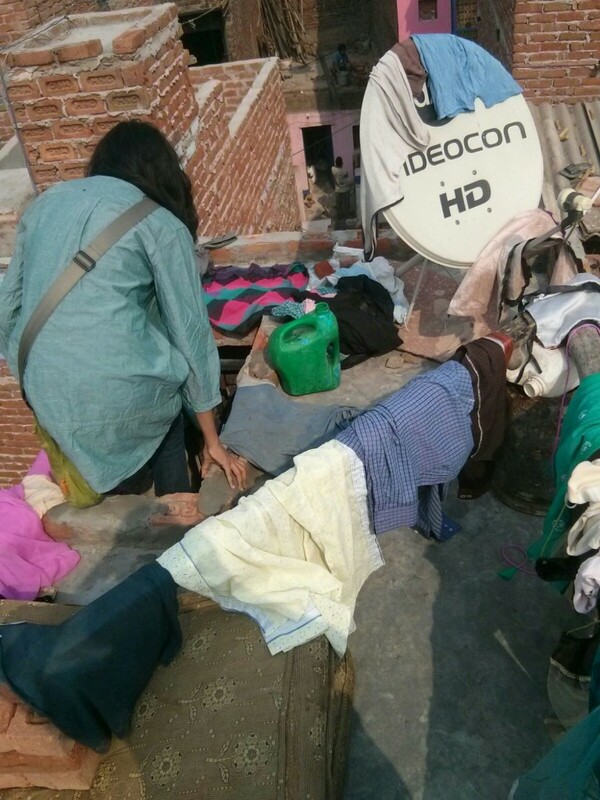 individual water supply, toilets, sewage lines, street light, paving) in different slums across the city under the Slum Networking Programming (SNP). The slums under SNP were even provided a no-eviction guarantee for 10 years. As a result, these slums already have services-infrastructure that they’re growing on, a great hybrid of planned and organic development. Or let’s take Hanoi – where to ensure the quality of the self-built housing that migrants construct, the regulatory authorities introduced an interesting policy. A structure can become legal if it adheres to safe construction standards and what’s more, it can even avail access to basic infrastructure like sanitation and electricity. Is it too much to hope that Delhi could learn from such examples and evolve policies and solutions? By plugging in the essential support systems of basic amenities and technical help for DIY construction, could we catalyze organic, informally built neighbourhoods? Neighbourhoods which would then be, in their true sense, more sustainable and resilient. These people have no access to ‘correct’ information and get guided by self-taught masons turned into building contractors. In addition to policy they need guidance. How can we organise architecture and civil engineering community to engage them without costing them a bomb? Can we get students of these disciplines to work with them? Thanks for your comment. As you rightly point out, homeowners in these contexts are guided by self-taught masons turned contractors. Access to technical know-how is key to making sound decisions in construction, which many lack. There could be multiple approaches to address this gap. One way, as you suggest, could be through a one-on-one involvement of homeowners with professionals or even students. It’d be interesting to know if you have something in mind to take it ahead!